Once the game was under way, it appeared as though Baltimore’s Scott McGregor and Pittsburgh’s Jim Bibby were going to duplicate the previous game’s pitching duel. Neither team mounted any threat in the first two innings, but second baseman Rich Dauer hit a line-drive home run to left field to lead off the bottom of the third that put the Orioles up 1-0. 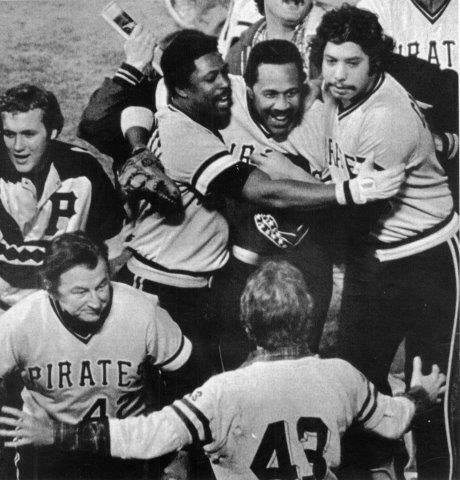 It was the only run Bibby and the Bucs relievers who followed him — Don Robinson, Grant Jackson and Kent Tekulve — would allow in Game Seven. After Phil Garner doubled to lead off the ninth inning, Orioles manager Earl Weaver “paraded a record five pitchers to the mound in a futile bid to stem the inevitable.”6 Mike Flanagan replaced Tim Stoddard with one out and gave up a single to Omar Moreno that scored Garner. Weaver then brought in Don Stanhouse, who surrendered a base hit to left-center by Tim Foli that advanced Moreno to third. Tippy Martinez took the mound next and loaded the bases by hitting Parker with a pitch. Finally, Dennis Martinez, the fifth Orioles pitcher of the inning, hit Bill Robinson with a pitch that brought Moreno home with the Pirates’ final run of the game. It did not take an astute spectator to sense the desperation behind Weaver’s procession of relievers, all of whom were ineffective and — as a group — gave up the last two runs that resulted in the final 4-1 score. Five Pirates accumulated double-digit hit totals: Willie Stargell (.400) and Phil Garner (.500) led the way with 12 each, Omar Moreno (.333) tallied 11, and Dave Parker (.345) and Tim Foli (.333) had 10 apiece. Foli also set a record for the most at-bats (30) without a strikeout.9 Bill Madlock batted .375 while rapping out nine hits and drawing five walks and, in Game Five, became one of three Pirates batters — along with Parker (Game One) and Stargell (Game Seven) — to tie the Series record of four hits in one game. The Orioles’ inability to stop the Pirates in the top of the ninth inning of Game Seven was simply a microcosm of the entire World Series, especially those games in which the Pirates bunched their hits together to score more runs. Stargell’s performance stood out above all, and he was the unanimous choice of the nine-man committee as the Most Valuable Player of the World Series.10 In addition to batting .400 with 7 RBIs, Stargell set a World Series record with seven extra-base hits — four doubles and three home runs (the Pirates’ only home runs in the seven games) — and tied Reggie Jackson’s 1977 record of 25 total bases.11 The award made Stargell the first player player to win the regular-season, League Championship Series, and World Series MVPs in the same season. For that matter, the Pirates made a clean sweep of all MVP awards in 1979 as Parker had been voted MVP of the All-Star Game that summer. Stargell turned serious for a moment when he was asked about Steadman’s column that had denigrated the Pirates’ use of the word “family” to describe their team. “Pops” Stargell, the Bucs’ inspirational father figure, said, “I thought that was unfair. That man didn’t live with us all year. He didn’t understand that we depend on closeness, that we are a family. No words can express what we’ve done. We’ve overcome. We’ve worked hard. We’ve scratched and clawed. We took that song ‘We Are Family’ and identified with it. We weren’t trying to be sassy or fancy. We’re just a ballclub that is a family in our clubhouse. And that’s why we won the World Series, that’s why we came from behind.”13 Stargell’s response was a fitting summary of the 1979 Pittsburgh Pirates. This article appeared in "When Pops Led the Family: The 1979 Pitttsburgh Pirates" (SABR, 2016), edited by Bill Nowlin and Gregory H. Wolf. To read more game stories from this book at the SABR Games Project, click here. 1 Pat Livingston, “Stand-Up Pirates Set Down Birds,” Pittsburgh Press, October 18, 1979. 2 Ron Fimrite, “Rising From the Ashes,” Sports Illustrated, October 29, 1979: 61-64. 3 Murray Chass, “Pirates Capture World Series With 4-1 Triumph,” New York Times, October 18, 1979. 4 Lowell Reidenbaugh, “Stargell’s Bat? Just Plain Poison!,” The Sporting News November 3, 1979: 43-44. 5 Dan Donovan, “Whew, It’s Over! Bucs Are Champs,” Pittsburgh Press, October 18, 1979. 8 “World Series Notes: Garner Won the Hard Fight,” Pittsburgh Press, October 18, 1979. 9 Lowell Reidenbaugh, “Room at Top Just for Bucs,” The Sporting News, November 3, 1979: 40. 13 Dave Anderson, “Pops Hit One for ‘The Family,’” New York Times, October 18, 1979.